: A scent hound par excellence, particularly fitted for hare and fox hunting. It can also be used as a leash hound. Its constitution is ideally suited to the vast open terrain in Istria. : Its history runs parallel to that of the short-haired Istrian Hound, but pictoral representations and written descriptions are rare, since dogs with tousled hair were less appreciated by artists on account of their untidy outline. 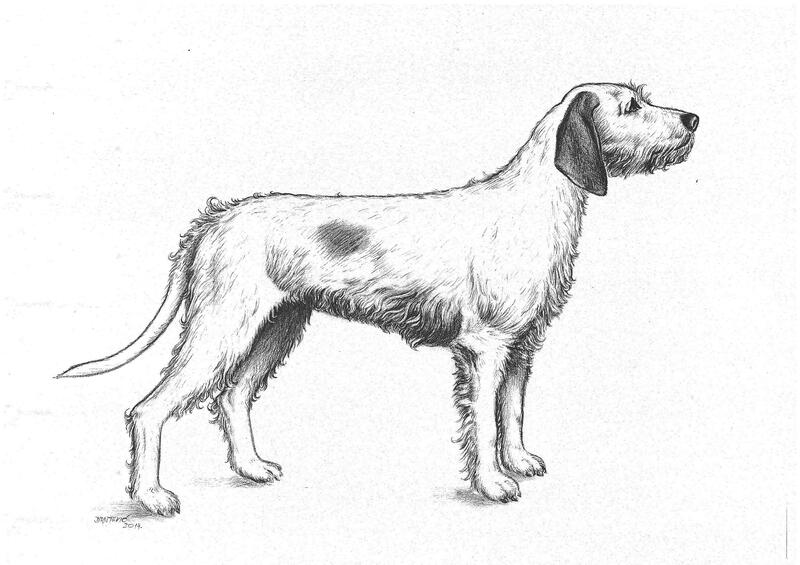 However, the wire-haired Istrian hound was described extensively by B.Laska in 1896 and in 1905 these dogs were sold in the Istrian regions of Buzet and Pazin under the name of “barbini”. The breed almost disappeared during the first world war. From 1924 on, these dogs were registered in the Croatian stud-book. FCI recognized the breed in 1948 and the first standard was published in 1969.
: The coat colour is snow white with lemon-orange markings. The hair is long and bristly. Oblong head with bushy eyebrows. Strong body, solid bone. Powerful tail, somewhat sabre-like. Dog’s expression is stern, gloomy and sometimes even sombre. Sonorous tongue of medium to deep tone. : Body length should be no more than 10% greater than height at withers. : Gentle, docile, calm and very attached to its owner. Although of fairly even temperament, it is nevertheless a very enthusiastic hunter. : The head is well-proportioned in relation to the body. Its length is 20-24 cm; it must not be too light, lips and eyerims should be darkly pigmented. : Slightly rounded. Occipital protuberance clearly visible as is the frontal furrow which is often covered by a lock of long supple hair. The frontal bone is quite broad. Skull narrows towards the eyes. : Broad with well-developed nostrils, black or dark pigmentation. : Strong, rectangular, broad bridge of the nose covered with shaggy moustache. Seen from the front, the lower jaw gives the muzzle a certain roundness. : Close-fitting, not too thick. : Strong, scissor bite complete dentition. : Dark iris pigmentation; the eyes are large but not bulging. The expression is serious. Given that their hair is coarse and longer, the eyebrows are bushy and thick. : Not very thick, covered with shorter hair. Set on not far from the eyes but not high, near the topline of the skull. The ears widen towards their middle and are carried close to the cheeks. They are reasonably long, thinner and rounded at the tips. When drawn forward they are considered very long if they reach to the tip of the nose, and long if they reach the canine teeth. They should be at least semi-long reaching to the superciliary arches. : Seen in profile the junction of the head and neck is visible at the back of the occipital protuberance. Length is 12-15 cm. The skin is taut, without dewlap. : The topline slopes gently towards the croup. : Level and broad. Length is proportion to height at withers. : Short, muscled and rounded. : Broad, especially in females. Slightly sloping, rounded, hips clearly visible. : Broad and deep, let down at least to the elbow. Usually circumference is about 12-15 cm more than height at withers. Well-sprung ribs. Point of sternum scarcely visible, rounded forechest. : The underline rises progressively from the xiphoid process to the groin. Belly slightly tucked up, flanks not very pronounced, should not be whippety. : Not set on too high, stronger at root and tapering towards tip, carried low with slight upward curve, reaching hock or just below. : Shoulder-blades sloping, long, muscled and well-attached to the thorax. Angle of scapulo-humeral joint is about 90 degrees. : Short, almost upright, but with a slight slope forming angle of 10 degrees with the vertical. : Cat feet but narrow, with tight toes; pads well-developed and resistant; strong nails. : Similar to front feet, often a little longer. : Short, broad and muscled. : Longer than thigh, sloping and well-muscled. : Short and upright, dewclaws, if any, should be removed. : Very smooth at walk; lively gait. : Elastic and taut over whole body, without wrinkle. Pinkish in colour. : The outer coat, also called top coat, is harsh, about 5-10 cm long, dull, bristly, never curly or wavy. Beneath this coarse coat, especially in winter, one can find a thick short undercoat. The outer coat does not lie close to the skin but is bristly it should not tangle or form felted locks. Length and thickness of coat will vary according to position on body. : Snow white is the ground colour. Ears are always orangey. On the forehead there is often a similarly coloured star-shaped mark. The ears can also be orange speckled, which is an indication of pure-breeding. Orange spots more or less widespread or flecks of the same colour can be present over the whole body but most usually at the root of the tail. These marks must not be numerous nor spread out in such a way as to overwhelm the snow white ground colour. These spots should be bright in colour, not pale nor dark nor brown, any of which would indicate cross-breeding. A third colour, even if only a few hairs, is unacceptable. Ideal height for males 52 cm. For females 50 cm. : The weight of an adult dog fed normally is 16-24 kg. An ideal average weight would be about 20 kg. Seen from the front, square mandible. Third eyelids visible (nictitating membrane). Nose too pink, lacking in pigmentation. Muzzle too blunt, too pointed or even upturned. Ears too short or carried too far away from the head, set too high or too low, with hair covering excessively long, silky, wavy, curly or even felted. Tail crooked or too short (docked). Any colour other than lemon-orange; never greyish spots and especially never blackish ones.